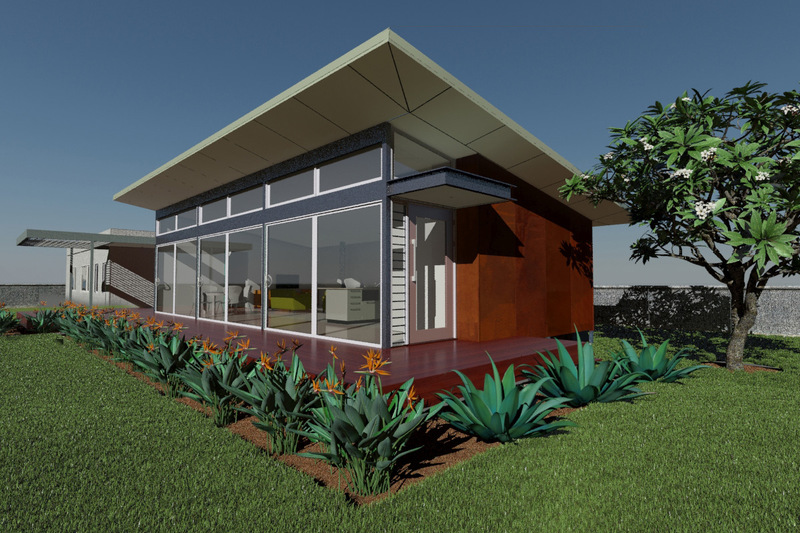 These narrow house floor plans deliver a low budget green building with low on-going budget costs and 182 sqm and 56 sqm of alfresco and terrace sun drenched open plan living areas. When correctly orientated on your site, the narrow house floor plans with their raking ceilings and ensure that this narrow house floor plans conform to passive solar design principles with each living space having the potential for solar heat gain during the cooler winter months. The Kitchen Living and Dining spaces are the focal point of the green building that are connected to the Alfresco and Terrace by three sets 2400mm high clear anodised end-sliding doors – transforming the green building to indoor outdoor living over the summer months. The efficiently planned and memorable space relationships of these narrow house floor plans can be constructed as either slab on ground construction or the cost effective patented prefab footing system. The material palette of these narrow house floor plans incorporate Corten steel, locally sourced Australian hardwood internal timber flooring and ‘Monument’ paint finish Scyon Axon cladding. The narrow house floor plans achieve an green building on a small budget by either slab on ground construction or utilising the cost effective patented prefab footing system, solar hot water and wood fuel firebox for wood fuel boosting. Visitors to the green building are greeted with a generous 2400mm high double glazed timber pivot door prior to being ushered into the spacious green building open plan living areas. The hub of the green building is the architect designed kitchen which incorporates the latest porcelain panel selections to the water fall edged kitchen island bench and also accentuates relationship between the kitchen hub and adjacent two living area. The narrow house floor plans of this green building also boast the latest porcelain panel selection kitchen perimeter benchtops, Blum Adventos lift coloured back glass overhead cupboards positioned above the benchtop height slot window. The concept of these narrow house floor plans place significant importance on sustainability and energy-efficiency design principles. The well considered narrow house floor plans cleverly achieve passive solar design principles when correctly sited allowing the open plan living spaces to capture the winter heat gain, when the sun is at lower azimuth, and eliminates the worst of the summer heat gain. The narrow house floor plans also feature highlight windows to maximise natural light through the daylight hours and vent stale hot air via ‘stack effect’ ventilation. The narrow house floor plans colour palette also includes clear anodised window frames, Arte Domus tiles throughout while the wall cladding material finishes for these narrow house floor plans combine horizontally formatted Corten steel with single lock standing seam which is juxtaposed against the vertically grooved Scyon Axon cladding for this green building’s higher BAL rating.